My name and words mentioned in The Guardian no less! FicShelf also found, it said, that “men are more likely to receive recognition for their work … with preconceived notions of a ‘literary canon’ and curated lists of top titles still dominated by male writers”. Male authors account for 80% of titles in the Telegraph’s “100 Novels Everyone Should Read”, 85% of the Guardian’s “100 Greatest Novels of all Time”, and 70% of the Telegraph’s “The Best Books of 2014”, it found. Do you ever toy with the idea of drawing on your expat experience to write a romantic novel? If so, there’s one storyline that must tempt you: British girl meets Man From Elsewhere, and moves to his country, leading, after some hiccups, to their very own happy ever after. Romantic novelist Angela Britnell (left) has lived this plot. She is originally from Cornwall, but she met her own tall, dark, handsome stranger when she was working for Nato in Denmark. He is American and the couple now live in Nashville – the setting for Angela’s novel What Happens in Nashville (angelabritnellromance.com). Janet Woods has a different backstory. She met her husband at school in the UK when they were three years old. They were born a day apart, lived in the same street, attended the same schools, married when they were 19 and migrated to Australia in the 1960s as “ten pound Poms”. But if you’ve written a romance of expat life, what are the odds that a UK agent or publisher will want it? While having characters move abroad can provide a good source of conflict for any novelist, have Janet and Angela been exceptionally lucky? Is it just wishful thinking that readers are intrigued by stories of the heroine finding her feet in a new country? Liz Fenwick (lizfenwick.com) is an American who moved to England, married a Brit, lived with him along the way in Calgary, Moscow, Jakarta and Houston, and finally moved to Dubai, where she writes novels about Cornwall. She is wary of using expat settings. Her novel A Cornish Affair begins on Cape Cod but apart from that is set in a crumbling Cornish clifftop mansion. Liz (left) said: “I worry publishers and agents think they can’t sell expat fiction, unless you, the author, already have a following. I think the realities of expat life are far away from the UK reader’s experience. So unless it’s a book that naturally fits in an expat setting like a thriller then possibly it’s less appealing to publishers than UK-based books. The problems are multiplied the further you live from London, but Alison pointed out distance is becoming less of an obstacle with the Internet and digital communication: “My agent took me on after a FaceTime conversation,” she explained. You can lose a lot of money if you pursue self-publication, especially if you want to produce physical rather than electronic copies of your books. Nonetheless there are advantages to physical copies, as many readers still prefer them. 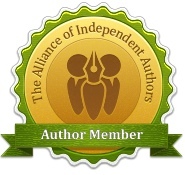 If you are inspired to write an expat romance, The UK-based Romantic Novelists’ Association is ready with support and advice, and is happy to welcome expat members (romanticnovelistsassociation.org). Rosie Milne, who is originally from London, lives in Singapore where she runs Asian Books Blog (asianbooksblog.com). Feminism has become a dirty word but it really shouldn’t be, after all it is just about equal rights for all, men and women alike. Since leaving these shores for France a few years ago, talented one time West Kent LocSec Alison Morton has embarked upon a career as a writer of alternate history novels. In March last year, Olive and I were honoured to be invited to the launch of the first of the novels in this series, Inceptio and we thoroughly enjoyed reading and immersing ourselves in this unusual thriller. Alison is very modest about the success of this absorbing tale but we understand that a reprint was necessitated to meet demand. Alison chose instead to subject herself to a grilling from writer friend Denise, who concentrated mainly upon the dramatis personae. This was followed by questions from the audience prior to signing of the books that many of us purchased. Although remaining fairly tight-lipped upon the subject, Alison let it slip that book number 4 is already under way with yet more to come in the future! In Writing Magazine (May 2014, page WN17), a lovely piece about PERFIDITAS, including a photo of me with Simon Scarrow! 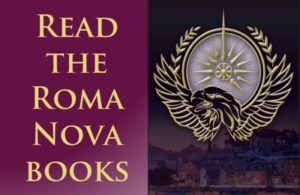 Just before the launch of PERFIDITAS on 6 November at Waterstones Tunbridge Wells, I went back into the Radio Kent studies to talk to Pat Marsh again. Very relaxed and friendly, it was like popping round for a friendly chat. 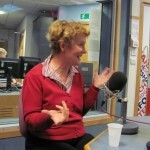 On 13 August, Pat Marsh, from BBC Radio Kent invited me on to his afternoon radio show and let me burble on about INCEPTIO. Radio Kent is said to have around 200,000 listeners, a figure I didn’t pin down until afterwards. I think I might have been a little more nervous if I’d known. 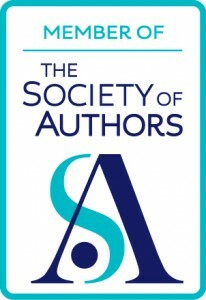 Very friendly and quick to set me at my ease Pat and his team are keen to support Kent authors. And they’ve invited me back to talk about the next book, PERFIDITAS, out in mid-October. And you can listen to the interview here! 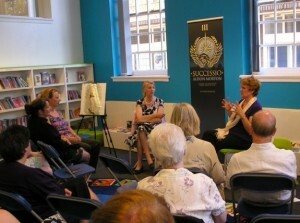 A fab report in ROYAL magazine of the INCEPTIO launch at Waterstones Tunbridge Wells. What a superb write-up. And yes, we had fun! Deepest thanks to Sarah Bond who wrote it, Gaynor Edwards who masterminded the PR for the evening and the Kent & Sussex Courier ROYAL team for the beautiful production. And to Steve Morton, of course, who took some of the photos. On 19 June, I was delighted to be interviewed by Lucy Walton for Female First. It’s a lively and very popular lifestyle blog brimming with information for the contemporary young woman. I was thrilled to have a 3-page spread about alternate history in the UK’s premier writers’ monthly “Writing Magazine” (July 2013 issue). Before the UK launch, local Tunbridge Wells magazine StayingInGoingOut, known as StayGo, ran a half page on INCEPTIO in their March edition. Fabulous! Le Courrier de l’Ouest which covers the French departments of Deux-Sévres 79 (where I live) and Maine-et-Loire 49 (Angers/Saumur) did a feature about INCEPTIO and the French launch on 1 March.